Winners of the 32nd Annual Awards for Excellence in Design were announced last night at the Thomas Leeser–designed BRIC Arts Media House in Brooklyn’s emerging Cultural District. 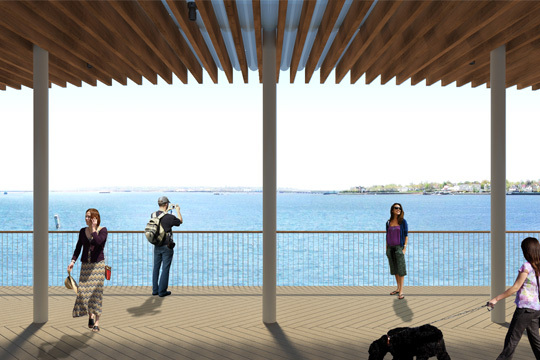 Mayor Bill de Blasio was on hand to honor the winning projects, which were selected by the city’s Design Commission. “While Brooklyn is my home borough, I am proud to be awarding a diverse group of projects representing all five New York City boroughs,” the mayor said in a statement. 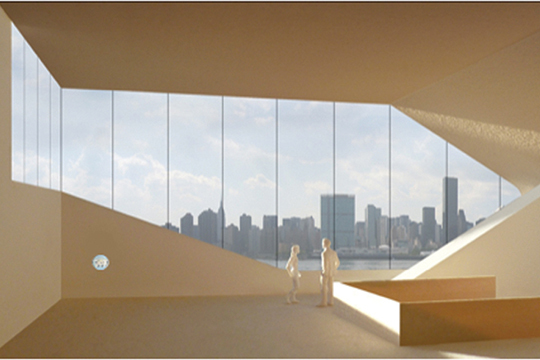 “This year’s winners exemplify the Design Commission’s mission to enhance every New Yorker’s quality of life through public design, regardless of their size or location of the project.” The 10 winning proposals are all unbuilt, but two special recognition awards were awarded to Tod Williams Billie Tsien’s LeFrak Center in Prospect Park and Louis Kahn’s Four Freedoms Park on Roosevelt Island. 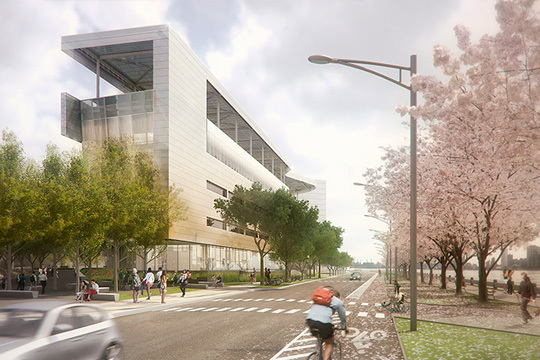 Cornell Tech’s first academic building establishes an inspiring atmosphere for graduate-level research that will foster interdisciplinary collaboration with shared work areas and flexible learning spaces. The dynamic facade features bronze-colored perforated metal panels with strategic openings to the glass curtain wall beneath to control natural lighting and capture views of Manhattan and Queens. A monumental stair tower extrudes from the main structure above the lobby space to unmistakably mark the entrance along the central pedestrian walkway. The expansive undulating canopy does double duty in shading the roof surface to reduce thermal load and supporting an array of photovoltaic panels. At the ground level, an outdoor cafe offers views south to the central plaza and lawn, which will ultimately form the heart of the campus. Whether tucked between book shelves, pushing up through the roof deck, or peeking out of the Q in the library’s sign, Julianne Swartz’s portal lenses serve to engage, orient, and disorient the viewer. Each lens presents a different optical distortion of the vista beyond-capturing a wide angle of the sky, inverting the Manhattan skyline, or multiplying focal points of the library’s garden. Taken together, the portals mirror the fundamental purpose of a library, where visitors seek out information, find themselves transported to new realities, and come away with a different perspective. 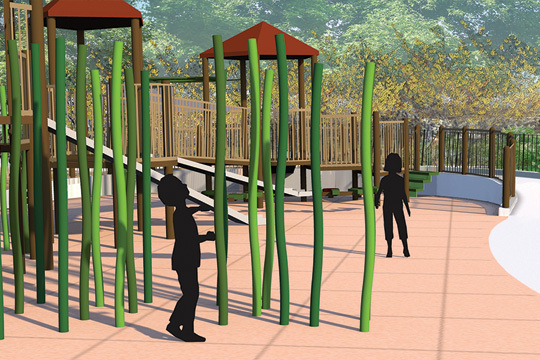 This sensitive playground reconstruction maximizes play value while respecting the aesthetic established in the 1930s, when Robert Moses included the original playground as part of the Works Progress Administration reconstruction of Sunset Park. 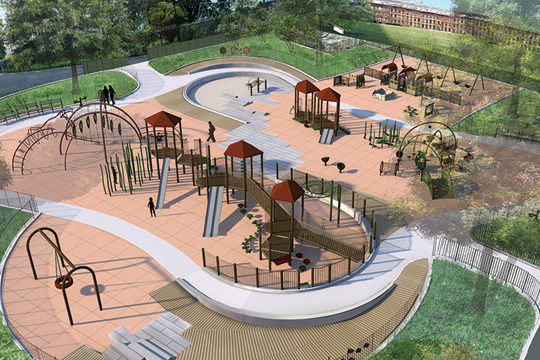 Within an enlarged footprint, undulating pathways define the perimeter, separate play spaces by age group, and unite all users at a central spray shower with in-ground jets. By incorporating grade changes, these paths double as play features-challenging children to climb, balance, and explore. The planting palette adds multi-stem trees, shrubs, and groundcovers to complement the mature shade trees and incorporate seasonal interest. Located across First Avenue from the United Nations headquarters, Lina Viste Grønli’s sculpture celebrates the legacy of Trygve Lie, the first Secretary-General of the United Nations. 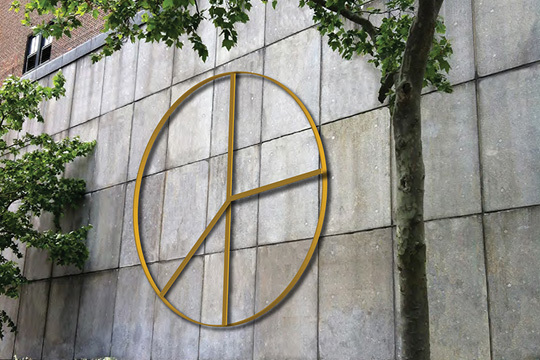 The Peace Clock is a 17-foot-diameter brass kinetic sculpture that functions abstractly as a clock. 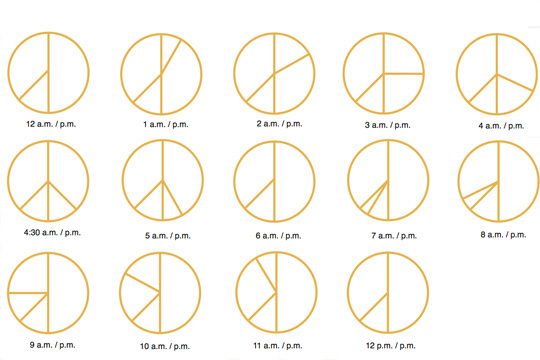 Twice a day, the hands of the clock form the Campaign for Nuclear Disarmament Symbol-more colloquially known as the Peace Sign. Inspired by the history of the UN’s formation and Lie’s dedication to peace and fundamental human freedom, Grønli’s clock stands as a reminder that time is both fleeting and infinite, always offering the opportunity to achieve world peace. Since its inception 60 years ago, the South Shore Little League has been a vibrant community institution, enriching the lives of thousands of children. 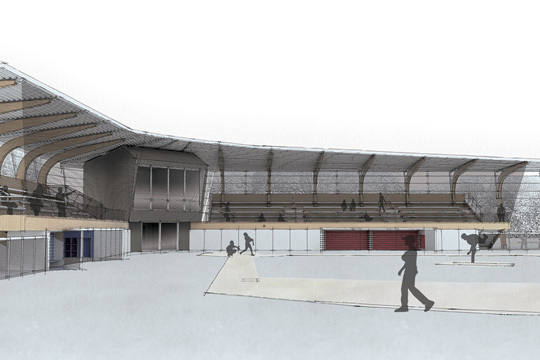 The new grandstand, named in memory of a young player, is formed by a series of glue-laminated bents clad in a perforated metal screen with white painted supergraphics and a standing seam metal roof. 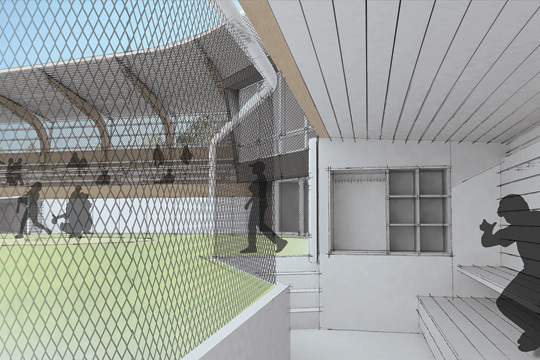 With covered seating for 275 spectators, an elevated press box, a conference room, and protected dugouts, this simple yet elegant structure is a home run! Perched at the water’s edge, not far from the 17th-century stone Conference House, the pavilion presents a simple yet contemporary complement to the historic structure. 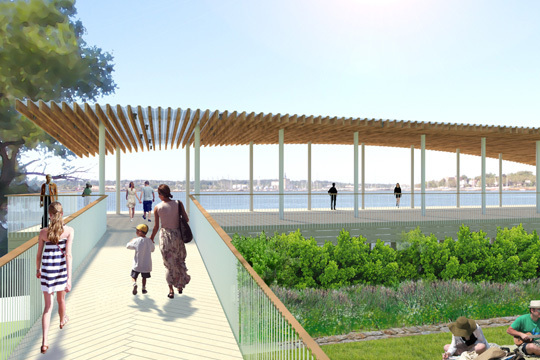 Set atop piles to raise it out of the floodplain, the structure forms a light and airy overlook and event space. The pavilion’s arched canopy layers translucent fiberglass over naturally moisture-resistant, glue-laminated cedar rafters to maximize natural light while shielding visitors from sun or inclement weather. A series of stone walls set into the upland lawn offers an attractive seating option but also works to control runoff along the slope. The redesign of the east entrance literally bridges the gap from the neighboring community to the Botanical Garden’s horticultural collections and programming. 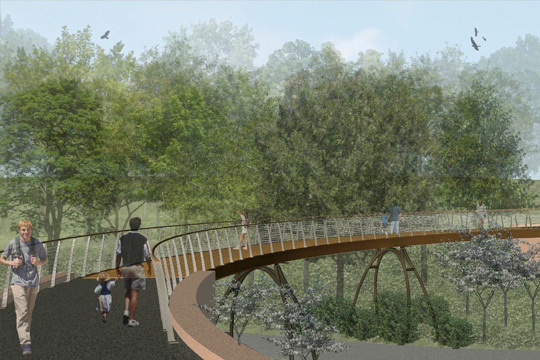 Visitors follow a winding path through a verdant slope and cross a domestic hardwood pedestrian bridge over the valley to find the state-of-the-art Edible Academy and Family Garden. Employing simple shed structures, the design showcases sustainable features, including a greenroof system, solar panels, and geothermal heating and cooling. 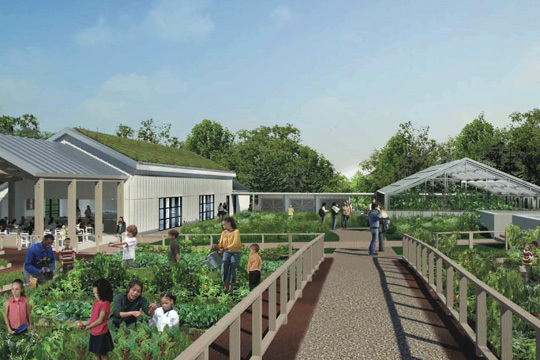 With classrooms featuring glass hangar doors for easy access to the garden plots and a decked overlook with views of the Bronx River, the Edible Academy and Family Garden promises to be an engaging and bucolic learning space. Set back from the busy thoroughfare of Northern Boulevard, the environmental center is nestled at the edge of Alley Pond Park. The redesigned center nearly doubles the size of the current facility, enhancing the staff’s ability to serve the 50,000 schoolchildren who visit annually. 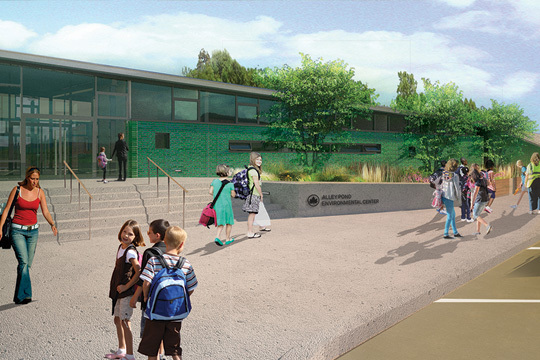 While a glazed brick facade presents a buffer to the road, the classrooms have large windows providing views into the park, and access to an exterior deck. The two facade treatments are unified by a sloped standing-seam metal roof, which folds down to drain water into an adjacent rain garden. By incorporating good environmental building practices, the Center’s new home is itself a teaching tool, helping the Center achieve its mission to preserve the city’s natural landscape. 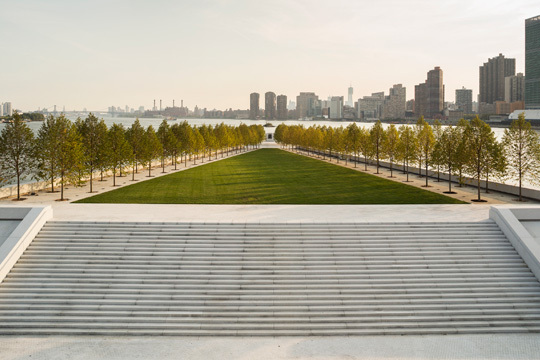 Four Freedoms Park commemorates President Franklin D. Roosevelt and celebrates the freedoms articulated in his famous 1941 State of the Union speech: Freedom of Speech and Expression, Freedom of Worship, Freedom from Want, and Freedom from Fear. Designed by Louis I. Kahn, the project was only realized nearly 40 years after his death. The design capitalizes on the island’s thin, triangular tip with a tapered lawn extending from the top of a grand entry stair, flanked with allées of littleleaf linden trees. 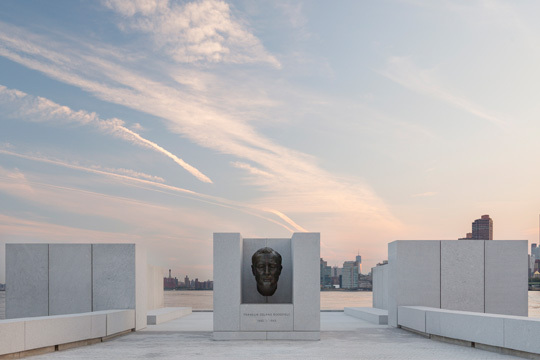 The symmetrical plan focuses the visitor’s gaze toward the threshold of an openair room partially enclosed with monumental slabs of granite, which contain an excerpt from Roosevelt’s speech. A master statesman and a master architect have, between them, given us a remarkable public space in which to contemplate these four essential freedoms. 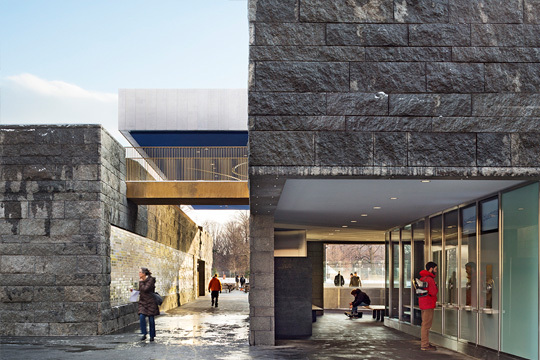 Constructed of rough-hewn granite and cloaked in earthen roofs, the LeFrak Center maintains a respectful low profile within the surrounding landmarked park. 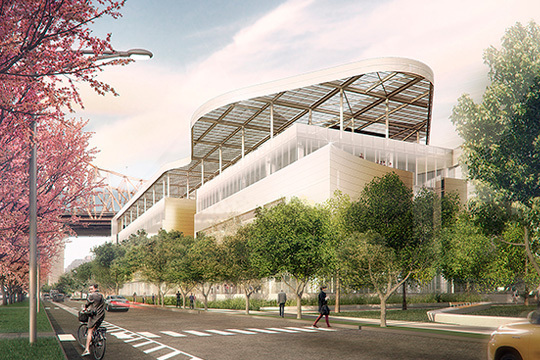 The one-story structures are linked with a bridge at roof level and frame an open-air elliptical skating rink and a regulation sized hockey rink. 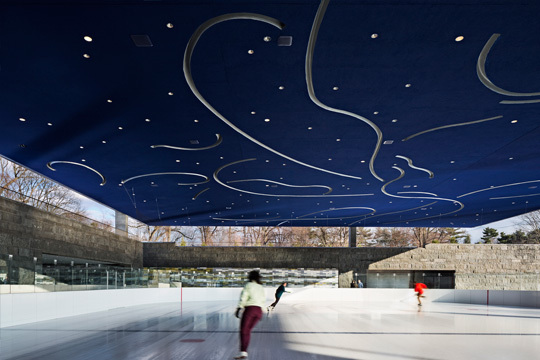 The hockey rink’s monumental canopy features a midnight blue ceiling carved with silver shapes inspired by figure skating footwork. In the warmer months, the rinks are thawed out for roller skating, special events, and a water play feature for children. Combined with the restoration of the lakeside landscape, the construction of the LeFrak Center is the most ambitious capital project in Prospect Park since the park was completed in 1867.